Great beach holidays: Jandia holidays lie on the southern tip of Fuerteventura, and take in several resorts stretching from the edge of Costa Calma down to the port of Morro del Jable. 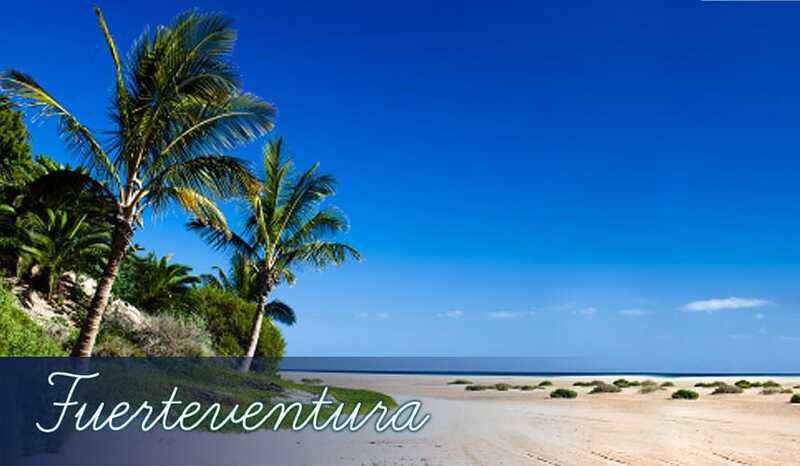 Playa de Sotavento is a beautiful place for beach holidays, and can claim to have one of the best beaches on Fuerteventura holidays. Open expanses: A little further inland, Jandia holidays have open expanses of green and stunning natural landscapes. Jandia Nature Reserve takes up the bulk of the area with stunning sand dunes and lush vegetation. Surfing holidays: Holidays to Jandia are very popular for windsurfing holidays, as there are strong winds out to sea on the Atlantic Ocean. In fact, it’s such a great spot for windsurfing, the PWA World Speed and Slalom Event takes place here every August. Jandia National Park: This beautiful nature reserve has many wildly different landscapes within its boundaries. There are low, dramatic sand dunes over La Pared Isthmus, while Pico de la Zarza is 807m above sea level and offers fantastic views across the whole peninsula of Jandia. Playa de Sotavento: This flat golden beach belongs to a lovely stretch of natural coastline in Jandia holidays with crystal clear water. Further out to sea, this is a popular place for windsurfers and kite surfers plus the Rene Egli Pro Windsurfing Centre is here too. Playa de Barlovento: A much less accessible beach than Playa de Sotavento, this one is for the windsurfing enthusiasts only! The wild waves make for high-octane action if you’re on water sports focused holidays here. Morro Jable Beach: There’s a glorious stretch of golden coastline all the way along the Jandia Peninsula. It’s just split into different sections depending on the town or region. Morro Jable’s part is one of the best, a flat sandy strip that’s actually divided in two itself. The lighthouse marks the point between the naturist and non-naturist parts of the beach, so be sure where you set up to sunbathe on your holidays if you don’t want to see any bare bits! El Bucanero de Jandia: A pleasant, relaxed restaurant offering a variety of international cuisine and cocktails. Located in the quiet little village of Morro Jable, you can relax in sunny weather on the outdoor terrace too. Posada San Borodon: Morro Jable certainly has the best restaurants on Jandia holidays, so you may want to choose from the holidays there simply for the greater eating options! Interestingly, Posada San Borodon is kitted out like a ship inside with wooden furniture and maritime memorabilia. Laja: Fresh fish is the order of the day in this excellent seafood restaurant. Expect simple, rustic dishes like Mussels with Garlic at great value prices. The beach front view also makes for a relaxing eating experience during your holidays in Jandia.